Since the dawn of Neopia, Aishas have wandered the planet with eyes that never open. However, in recent years more and more open-eyed Aishas have appeared on Neopia. This raises the question; can only some Aishas open their eyes, or do the majority of them simply choose not to? If they choose not to, then why? If only some can do it, then how? I, Mystery, set out on a journey to find these strange Aishas and, more importantly, the answer to my question. Hey... she's an Aisha... and her eyes are open! That stunning realization prompted me to ask Abigail why or how she opens her eyes. "You can't expect me to play all these games with my eyes closed, do you?" was her response, and then another fan asked her for an autograph. Abigail's answer made me wonder if Aishas can see with their eyes closed or not. My own Aisha, whose eyes I've never seen, claims he can see perfectly well, so perhaps only a handful of Aishas can't see with closed eyes? Anybody who owns a ghost or zombie Aisha will know that these particular Aishas also show their eyes to the world. Perhaps, however, this is something to do with the undead? Even the ghost Chia, another Neopet species with permanently closed eyes, opens them. But just because an Aisha opens their eyes doesn't mean they are undead. Take Princess Amira for example. In a land full of sand blowing all over the place you'd think any Neopet who lives there would want to close their eyes. It may be something inherited from parents. Princess Amira's father was a Lupe after all, and we all know that Lupes can open their eyes perfectly well. When I tried to speak to Princess Amira I was simply shooed away, so instead I spoke to Imiya, the star of Maths Nightmare, to ask her why she opens her eyes. "I don't mean to," she said. "It's my alarm clock. It's so loud that it startles me awake every morning and my eyes almost pop out of my head. I really need to get a new one." I pondered over Imiya's words. Maybe, just maybe, it was shock that caused an Aisha's eyes to pop open? I thought back to the other open-eyed Aishas. Princess Amira lost her father, and so suddenly. That would be pretty shocking. Abigail... well, I don't know about Abigail. Maybe the tragic realization that she'd always be second best to her brother when it comes to games? And as for ghost and zombie Aishas, I think I'd be pretty spooked too if I were undead. So, I thought to myself, am I any closer to unraveling this mystery? Perhaps. The 'shock' and 'inheritance' theories seemed to be the most likely, but I had one more theory up my sleeve - aliens. I headed for the vending machine in the Neopian Plaza in hopes of meeting an alien Aisha. I waited for hours, but eventually a green alien came along and opened the machine, collecting the nerkmids inside and putting them in a bag. "E-Excuse me!" I called. The Aisha looked startled as he spotted me. "Do you have a minute? I want to ask you a few questions." The Aisha raised an eyebrow, clearly suspicious. "What kind of questions?" It took a while to convince the Aisha that I wasn't after any top secret information. I asked him if he knew of any alien Aishas that had open eyes. He thought hard for a few seconds, then said, "My Supreme Commander, Arlhox VII, but that's it." The alien Aisha was clearly busy, so I thanked him and let him go. If only one alien had open eyes I could pretty much scrap the 'alien' theory. I couldn't help but wonder how that particular alien Aisha ended up with open eyes in the first place, but I doubted I would be able to go to Kreludor - or wherever alien Aishas come from - any time soon. 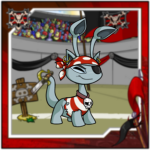 I decided to put my 'shock' theory to the test with my pirate Aisha, Golasd. We threw him a surprise party with balloons and presents and cake and all that party stuff. My pets and I waited in the dark, whispering and giggling, until eventually Golasd entered the room and the lights flickered on. But that's all he was; surprised. His eyes remained firmly shut. I had another trick up my sleeve, or should I say, in the cake. The cake was just a balloon smothered in icing. My pets gathered around the table, I handed Golasd the cake knife, he pressed it deep into the frosting - BANG! - cake icing and pieces of balloon exploded everywhere. Stunned silence fell upon my Neopets. Then we all burst out laughing. But Golasd's eyes were no more open than they were before. I gave him a pair of contact lenses as a present, suggesting that he try them on straight away, but he simply said, "Maybe later." My last resort was to tell my poor Aisha that it was a goodbye party and we were sending him to the pound the next day, which was sure to shock him, but I wasn't mean enough to spoil the party for him and possibly the rest of my pets, so I kept quiet and polished off the chocolates instead. Maybe what counts as shocking enough to open their eyes differs from Aisha to Aisha. So did I ever discover exactly why some Aishas' eyes open? It could be a number of reasons. It could be no reason at all. I never really did find out the true reason behind it, though I think I may be just a little bit closer. But whether they open their eyes or not, Aishas are our beloved Neopets and they always will be.